Coastal Southerners always live with the reality of hurricanes, although they usually hit beach resorts rather than urban areas. That made Katrina's landfall near New Orleans in 2005 somewhat remarkable, though the city was damaged less by the high winds and storm surges of Katrina itself than by the failure of the city's levee system that was overtaxed by the extra water that Katrina brought to bear on it. But true devastation it was, and continues to be for many areas of the city and for many of the people who were living there when the disaster struck. No wonder that a large and growing body of art devoted to Katrina and its aftermath is emerging as people get back on their feet and try to make some sense of this truly live-changing event. 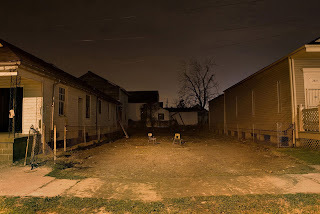 The Louisiana State Museum site in New Orleans, known as the Presbytere, has just opened a show of work by twelve New Orleans photographers documenting the impact of Hurricanes Katrina and Rita on their work and in their vision of the city. The show is called Before During After, and includes 38 large format images, including the one above, called "Solomon" by its maker Frank Relle, a New Orleans-based photographer. The Presbytere is at 751 Chartres Street in New Orleans, and is open daily (except Mondays and major holidays) from 10 AM to 4:30 PM. The show is up through August 31st, 2011, and is intended to complement the the Museum's new $7.5 million permanent exhibition Living with Hurricanes: Katrina and Beyond. Photographers in the show include Eric Julian, Elizabeth Kleinveld, Rowan Metzner, David Rae Morris, Thomas Neff, Samuel Portera, Frank Relle, Jennifer Shaw, Mark Sindler, Zack Smith, Jonathan Traviesa, and Lori Waselchuk. The show joins images with personal artists' statements to document how the aftermath of Katrina changed the way these photographers believe they choose subject matter, media, and photographic technique. There is also a book, with the same title, from the University of New Orleans Press, edited by Elizabeth Kleinfeld, that includes images from the show plus essays and commentary. The show, and the book, have a Facebook page, here. Her x-ray meditations on Katrina, based on her work with her grandmother's doll collection that was destroyed by Katrina's floods, are on display at the Jennifer Schwartz Gallery in Atlanta, in a show entitled Taken by the Fog, opening March 3rd, and up through April 2nd, 2011, on Tuesday - Saturday from 11-5 at the Tula Arts Center at 75 Bennett Street in Atlanta. 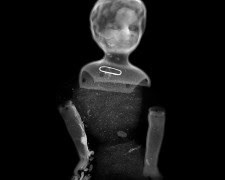 You can't get more Southern than working with your grandmother's doll collection, and with x-rays, too. Who said the past is dead? Not here. The past lives and reveals something of its history in these haunting images that reveal the dolls and also stuff hidden inside the dolls, stuff that for de Boisblanc caused the dolls to take on the character of objects with, as the Gallery puts it, "an internal spirit, some of strength and others of broken hearts. . . a story emerging, making some sense out of the loss experienced after the hurricane." There is a review of this show, here. Definitely worth a look, if you are in Atlanta.